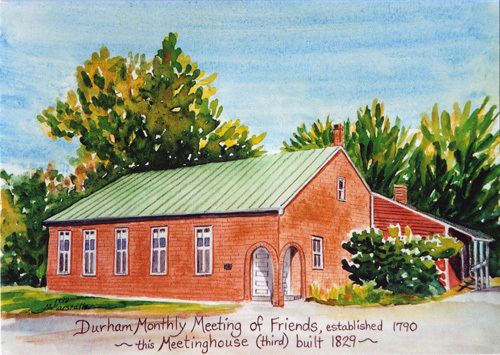 In 2014, Durham Friends Meeting held a series of Visioning sessions to better understand who we are and where we would like to go as a Quaker Meeting. At the end, the Committee on Ministry and Counsel drafted the following statement of our aspirations. It describes seven aspects or faces of our Meeting that state who we are. With each, it identifies (a) what we are currently doing and (b) our hopes for the future. Circle of Friends; admire, encourage, love each other. Occasionally support/clearness committees for individuals. Friendly Dinners and discussions to bring up some good ideas and become more familiar. Improve our follow up with visitors/seekers ? could greeters attend to a new person during the coffee hour? Is Pastoral care team able to meet the needs that arise? communication, organization? Learning community of truth seekers. Message bringers from within Durham Mtg and wider Quakerism, as well as pastor. Our present pastor is a great fit and part time seems to be working for all. Have some/need more newer people on committees, at business meeting. Continue variety of spirit centered gatherings; adult Sunday school, Contemplative prayer, midweek worship, Godly play. Outreach to seekers/engagement w/ seekers. The work formerly done by publicity committee….visibility in the media. Knowledge of Bible, Quaker testimonies and history. Expand our spiritual language to be inclusive of other beliefs, as well as Christianity. Need Webmaster to update/ recreate webpage, Facebook. 3. Growing community; playful, joyful living in challenging world. Excellent youth pastor, youth group and Godly play. Outdoor play equipment assembled, available w/ supervision. Best ways to meet needs of young children during Meeting for Worship. Provide opportunities for our young people to participate in meaningful service projects (intergenerational as well). Wendy may want help creating a Durham Friends banner, for activism/ parades, to expand visibility. A local 12step and environmental groups meet here. Joys & concerns of individuals during worship. Announcements of local activism opportunities. Support in death & dying. Plan activism based on Quaker values to be local change makers. Spiritual community; based on Quaker/ Christian values and sense of the meeting. Study and worship groups, variety of gatherings. Decisions at Monthly Meeting for Business…when there are differences. We have a gifted and committed clerk. Member who serves Council of Churches. Continue our education and engagement w/ concepts like racism and white privilege. Start meeting for worship, for business and M&C w/ query from Quaker roots. Tolerant and humble community; welcoming new ways of understanding God, blended with our traditional beliefs. Sunday potluck programs often educate and encourage . Continuing revelation a central tradition of Quakers. Continue to follow leadings; P&SC and others. Continue creating space for openness and respect of other faith traditions. Responsible community; financial viability, stewardship of our land and buildings, good governance and clear communication. Offering coming directly from people’s banks is helpful for consistency. Consistently meet our budget with a pastor here. Clear reports on proposed projects to aid decision-making. Regular financial updates and education where ALL can see/ hear….rise of Mtg? Cell tower project is in process, contract was signed. This entry was posted in Articles, Monthly Meeting Minutes. Bookmark the permalink.